Two days after finishing 2nd to rivals, PSV by a mere point, Erik ten Hag left the club by mutual consent. Ajax failed to make it to the Champions League group stage, but fared particularly well in the Europa League, getting knocked out by Sporting Lisbon on the away goal rule in the Quarter Finals. That was also how far they made it in KNVB Cup losing on penalties to PEC Zwolle. To replace ten Hag they looked no further than Jong Ajax and Dutch legend, Milan de Koningh. Milan was born and raised in Amstelveen and grew up supporting Ajax and idolising, Johan Cruyff and finally got to watch his idol when Johan returned to Amsterdam in 1981. Milan joined Ajax as a fresh faced eight year old and spent the entirety of his career in Amsterdam. He broke into the first team in 92’ at the age of 16 and enjoyed a fruitful time with Ajax, before finally retiring at the end of the 11-12 season, and at the ripe old age of 36. He retired with 8 Eredivisie, 7 KNVB Cups, 7 Dutch Super Cups, 1 Intercontinental Cup, 1 European Super Cup, 1 Uefa Cup and the Champions League at the age of 19. He and Ajax had a lean spell between 99’ & 01’, before picking up again. Milan got to play with Rijkaard, Bergkamp, Frank and Ronald De Boer, van der Sar, Seedorf, Davids, Reiziger, Bogarde, Kanu, Litmanen, Blind, Kluivert and many, many more. But everyone departed for bigger and better things, but not de Koningh. 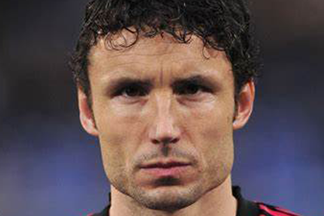 He stayed loyal to Ajax and made 80 appearances for Netherlands, scoring a healthy 34 goals in the process. He didn’t see any success with the national team, and considering the players that had available, they should’ve. But Milan’s playing career was a glorious one. And he had offers to leave, but Amsterdam was his HOME. And after a few years coaching, he’s answered the call to help de Godenzonen on another successful journey, or he’ll die trying. We’ll start with Dutch football where PSV won the Eredivisie and won the Dutch Super Cup, beating Feyenoord 3-2, but lost out to Vitesse in the KNVB cup. Atletico Madrid took home the La Liga Championship, Real Madrid won the Copa del Rey and Sevilla won the Spanish Super Cup. Napoli released Juventus grip on Serie A, as they won their first league title in 29 years, and they almost won the double, but lost to Lazio on penalties in the Coppa Italia. Juventus did win the Super Cup. Borussia Dortmund captured the Bundesliga as RB Leipzig finished 6 points behind them and Bayern in 3rd. VfB Stuttgart won the German Cup beating Frankfurt who took home the Super Cup once again beating Bayern, but this time on penalties. Manchester City as you’d expect, won the Premier League for the 6th time and have won it back to back for the first time ever. They completed a treble, winning the Carabao Cup and Community Shield, whilst Manchester United won the F.A Cup. Making sure all the major trophies in England, went to the city of Manchester. Atletico Madrid beat their rivals, Real 3-1 in the European Super Cup. While Benfica beat Villarreal to lift the Europa League. And the Champions League final was contested between two teams that finished 3rd in their leagues, as Juventus took on Barcelona and a Ronaldo inspired Juventus won it 3-0 and within an hour of losing the final, Ernesto Valverde’s contract was terminated as a result of how poor the season ended for Barcelona. With Frenkie de Jong heading to Barcelona in a £67 million plus deal, and the futures of Matthijs De Ligt, Nicolas Tagliafico, Dusan Tadic, David Neres, Hakim Ziyech and Kasper Dolberg all being tracked by the vultures wanting to pick apart the team like they did with AS Monaco a few years ago. It could be a testing time for Milan. But also on the upside, it will allow him to build and mould the team into how he wants, with the players he wants. And he’s making inroads to that already and is going about to improve on what they’ve got. And with his time in Jong Ajax, he’s promoted Boy Kemper, who can play on the left of defence and in the center. Perr Schuurs who could potentially replace De Ligt. Danilo Pereira, a brazilian attacker. Hassane Bande, an attacker from Burkina Faso and Kaj Sierhuis, the heir to Dolberg’s throne. Don't think I don't see what's going on here, I like it. Ajax’s Champions League adventure ended last season at the 3rd qualifying phase, against Slavia Prague. A 2-1 defeat away from home, coupled with a 0-0 draw at home, sent Slavia Prague to the group stages, and Ajax into the Europa League. The fans, the players and the former manager, Erik ten Hag were left devastated and posted a credible quarter final appearance in Europe’s second competition. And new manager, Milan de Koningh will oversee his first competitive game in the 2nd qualifying phase of the Champions League, and against none other than Slavia Prague. de Koningh will have to do without Frenkie de Jong, and his rebuilding the squad has taken shape. With the £12 million left over from last season’s budget, Milan struck whilst the iron was hot. He brought in Jores Okore at CB and for a bargain £700k, who is an able backup and has alot of experience, so for Milan it was a no brainer. Next up was a 19 year old, Iago Oliveira from Portimonense for a small fee of £45.5k. Iago is a left footed, brazilian playing the role of a mezzala. But Milan will be patient with this one, as Iago needs work to turn himself into a great footballer. The potential is there. Another brazilian coming into the club is 18 year old, Ramires from BAH for a fee of £5.5m and Ramires can definitely be the club’s next big star. Ajax and Milan beat off many clubs for the signature of 19 year old, Sandro Tonali from Brescia for £9m. And following him is another highly rated youngster, 17 year old Pelayo Morilla from Gijon for a low sum of £1.5m. Experienced Jairo from Hamburg SV, joins for £375k and not a free like Milan had originally hoped. But he will provide experience, speed and skill on both flanks. From Velez, arrived Alvaro Barreal for £1.8m and the 18 year old Argentinian can excite the crowd on both flanks, like Jairo. Giorgi Arabidze arrives from Nacional da Madeira for £900k and the 21 year old will provide competition on the right wing and in attack. Dejan Joveljic joins from Red Star Belgrade for £850k and the 19 year old, pressing forward certainly has the potential to become a great signing for Ajax. And last, but by no means least, Lucas Beltran joins from River at £1.5m and will give Dolberg some much needed competition up top. But Milan de Koningh won’t stop there. If he sees a viable player that will improve Ajax’s first team and squad, he’ll snap them up. Revenge is definitely on the cards here! It's fate that Ajax were drawn against Slavia. Now go out and get the win over the two legs! The transfer window has slammed shut in Holland, and staggeringly Ajax have made a huge twenty signings, with eight heading out of the Johan Cruijff Arena. Milan de Koningh has significantly strengthened the squad overall and along with the earlier signings he made. He also brought in highly rated wonderkid, Antonio Marin from Dinamo Zagreb for £8 million. And in a shock transfer on the same day, he brought in another wonderkid, Troy Parrott for a low fee of £2.5 million, which has the manager and fans purring with excitement. But another striker from Tottenham followed, as Milan brought Vincent Janssen back to Holland in a deal worth £6.25 million. Janssen struggled enormously at Spurs, and de Koningh believes he can become an integral part of Ajax's future success. de Koningh brought in competition for Andre Onana, and struck a deal with Maccabi Tel-Aviv for Predrag Rajkovic for a measly sum of £1.6 million. He also signed an unknown 18 year old, Angelo Stiller on a free transfer. With another eye on the future, de Koningh signed Mateu Morey and Jay DaSilva for £900k and on loan respectively. And even with the plethora of talent up front, de Koningh wanted one more. And he got his man in the shape of Raul De Tomas from Real Madrid for £4.3 million and De Tomas comes highly recommended and should tear up the defences in the Eredivisie. But de Koningh left the best, till last, signing Arjen Robben on a season long loan shortly before the window closed. A capture he was extremely chuffed at. "Signing Arjen was something i couldn't pass up. We got to play together for a few years at International level and he's a great guy, vastly respected and a huge talent. And even though he's 35, he's still a world class player and one that will help us in the coming months and hopefully really give us a push in the right direction." Said de Koningh at the unveiling. "Coming to Ajax was an easy decision to make. Coming back to my roots, playing for Milan, with these fantastic fans in this fantastic stadium, it was a no brainer. And i'm sure we can make an impact in the Champions League as well as bringing home the Eredivisie. I can't wait to get started here." Arjen Robben clearly happy to be at Ajax and back in his country of birth. And what a signing this one could turn out to be. Champions League Best Placed Qual.2, First Leg. "Lads, tonight there's a lot of pressure and expectation placed on your shoulders. But nothing less than an impressive victory won't do. We need to shut them out, and shut them up. They talked a lot of crap last season after they knocked us out. It's not happening again, so go out there and show them what we're truly made off. Progressing is key to our success, so show me you've got what it takes to take this club forward." de Koningh's pre match speech seemed to have done the trick, as from the first whistle, Ajax were rampant and it only took eight minutes before David Neres thumped home a blistering left footed shot that nestled in to the top right and the Slavia Prague keeper had no chance. And twenty minutes later, Vincent Janssen drilled home from an acute angle to give Ajax a 2-0 lead. Which despite their untold dominance, they didn't add to. Champions League Best Placed Qual.2, Second Leg. The second leg was much closer, but ultimately it was Ajax that sought revenge for the year before as goals from Vincent Janssen and Marcus Llorente, before Mick van Buren gave Slavia Prague a consolation goal in the game and the tie. "I'm over the moon. Over the course of the 180 minutes we were far and above the best team. And i think the ghosts of a year ago have been buried. But much sterner tests will come. And progressing to the Group Stage of the Champions League is imperative for this club. Not only on the financial side of things. But this club deserves to be mixing it with the top guns in Europe." A lot of activity in the window from Ajax. Plenty of talent has been brought in to significantly strengthen the squad, now it's simply a question as to whether the lack of cohesion to begin with will affect results on the pitch to begin with. No such problems were faced in the Champions League however, so perhaps not. A fantastic pair of results to extract revenge on Slavia too! Wow! So many signings and hopefully a big boost in merchandise sales with Robben coming in. Great results in the CL too! 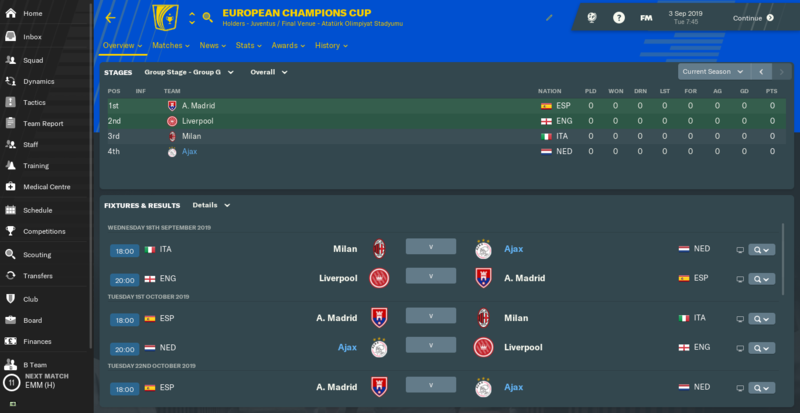 Champions League Best Placed Third Qualifying Phase, first leg. After Ajax advanced into the third qualifying phase, after beating Slavia Prague. They’ve been drawn against Club Brugge. Brugge are Belgium’s second most successful side, behind Anderlecht and it will be a homecoming for former Ajax star, Stefano Denswil who has been at Brugge since leaving Ajax five years ago. The first half passed uneventful as Ajax were by far the better team, and at the start of the second half is were it started to go wrong, as a shot from Vossen was put into his own goal by the Ajax keeper, Andre Onana, who was left red faced after that blunder. But Ajax rallied and three minutes later, Vincent Janssen was put clean through by a lovely assist from Marin and slotted home to level the tie. 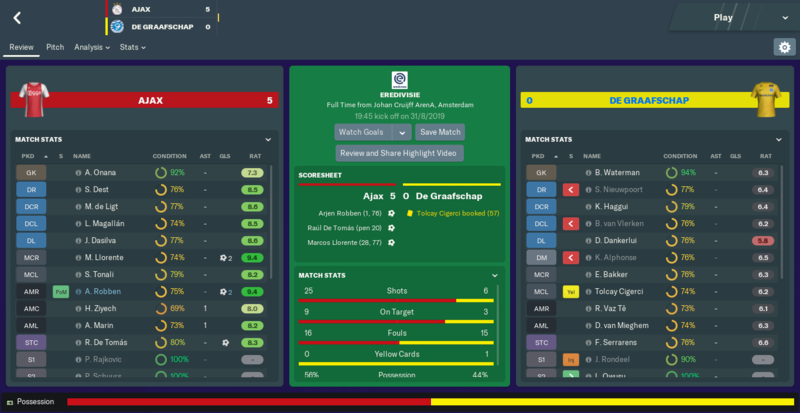 And with fifthteen minutes left of the game, Janssen turned supplier and put in a lovely cross for De Tomas to head home after coming off the bench to score on his debut and send the home crowd into raptures. “We knew Brugge was a tougher game than Slavia, but we equipped ourselves well and thankfully turned the game around and didn’t let our heads drop. We just need to make the short trip to Belgium now and make sure we keep a clean sheet and we’re through. But i’m proud of the lads, they put in a real shift tonight. But it matters for nothing if we don’t follow through with our efforts, next week.” Milan was happy, but also knew the tie could turn on it’s head in an instance, and he’s looking to avoid that. Milan completely changed the team for the Eredivisie opener, as they visited Venlo. And new signing, Dejan Joveljic put away a hattrick on his debut to delight, Milan and the away crowd. Champions League Best Placed Third Qualifying Phase, second leg. The second leg in Brugge, went like a dream. Ajax opened the scoring in the 24th minute own goal from Brandon Mechele. Two quickfire goals from Raul De Tomas in the 53rd and 57th minute put Ajax in complete control and Neres sealed their progression in the 79th minute with a thunderbolt. Jelle Vossen pulled one back for the hosts, but Ajax were supreme and Milan enjoyed the victory as they edge one step closer to the Champions League group stage. "The performance was brilliant, the lads were brilliant. From the 1st to the last minute, we completely controlled them. And now, a tie against Marseille awaits us. And that will be a completely different kettle of fish." A set of great results there, especially your triumph over Brugge. One more hurdle to overcome! With a Champions League game away from home against Marseille and just three days after the away trip to Brugge, Milan rang the changes to keep things fresh. As his main aim for the start of the season was to gain Champions League qualification to the group stages, so the league took a back seat. But despite the close scoreline, Ajax were rampant and hit the woodwork an incredible FIVE times. And Dejan Joveljic continued his brilliant start to his Ajax career with a brace, goals coming in the 15th and 59th minute as Ajax took control. But Rayhi pulled one back in the 91st minute, to make it an anxious couple of minutes right at the end. In a tense and hard fought match, Ajax surprisingly took the game to Marseille and could’ve had a two goal lead, but for great goalkeeping by Steve Mandanda. Before eventually Raul De Tomas opened up the scoring with eight minutes left in the game to send the away support and his manager into a fit of hysterics. Three minutes later, they were celebrating even further as Pelayo Morilla gave them a two goal lead and two precious away goals. Mario Balotelli pulled one back for Marseille to give them some hope in the 87th minute, but Ajax held on for a famous victory away from home. “I’m over the moon, but it’s just half time. We’ve got to play our natural game next week, no sitting back and holding onto what is effectively a two goal lead. But i’m so chuffed with the lads, they’ve worked hard for this. And now to see it through. 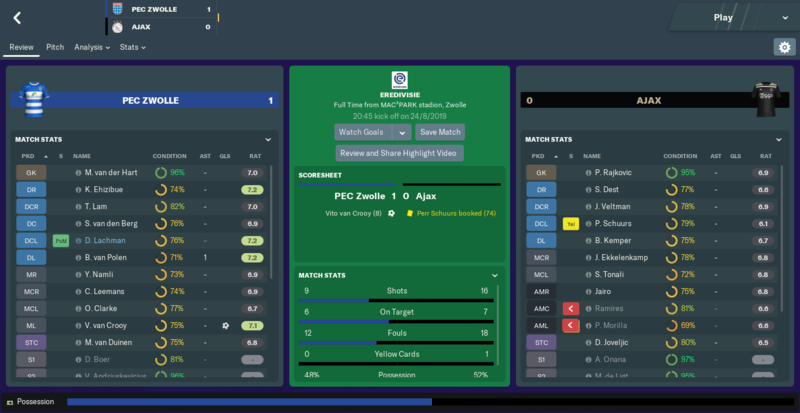 With confidence at a high, Ajax were expected to sweep Zwolle aside, but it didn’t happen that way as in the 8th minute Vito van Crooy put Zwolle ahead with what turned out to be the only goal of the game, as Ajax fell to their first defeat under Milan. Despite the shock defeat to Zwolle, three days prior, Ajax had a full strength side against Marseille and instantly took the game to them, creating chance after chance, but weren’t clinical enough, until Raul De Tomas popped up in the 47th minute. And it wasn’t until the 74th minute and another Neres thunderbolt, that the home crowd and Milan could really relax as it stayed 2-0 on the night and 4-1 on aggregate, and Ajax are now into the group stages of the Champions League . "The performance was brilliant, the lads were brilliant. From the 1st to the last minute, we completely controlled them. To do that against a team of Marseille’s quality is phenomenal and puts us in good stead for whoever we draw in the group stages, and we can relax now and enjoy the adventure. Ajax returned to league action in impressive fashion, as they ran roughshod over De Graafschap and Arjen Robben on his debut, opened the scoring just 35 seconds into his debut. He added his second and Ajax’s fourth in the 76th minute, with goals from De Tomas from the spot in the 20th minute and Marcos Llorente added a third in the 28th minute and he also scored his second and Ajax’s 5th in the 77th minute as Milan’s team were much more clinical today, and put the poor performance and defeat away to Zwolle behind them. And the Champions League group stage, has been drawn. And Ajax have a huge task ahead of them. After being drawn with Liverpool, Atletico Madrid and Milan, in what everyone is describing as the group of death. Ajax’s rivals and the only other team from Holland to get into the group stages, are PSV and they’ve been drawn with Real Madrid, Borussia Dortmund and APOEL, so PSV are expected to at least progress to the Europa League knockout stages. Some great results there, beside the surprise loss to Zwolle. You've been drawn into an incredibly difficult group in the Champions League and I will be surprised if you make it out, however it's not impossible. Best of luck! You are reading "de Godenzonen".